[by Róisín Curé in Galway] I love the storytelling aspect of being an urban sketcher. It's completely natural for me to draw something that illustrates a story I want to tell, and to write a story to elaborate on a drawing I have made. 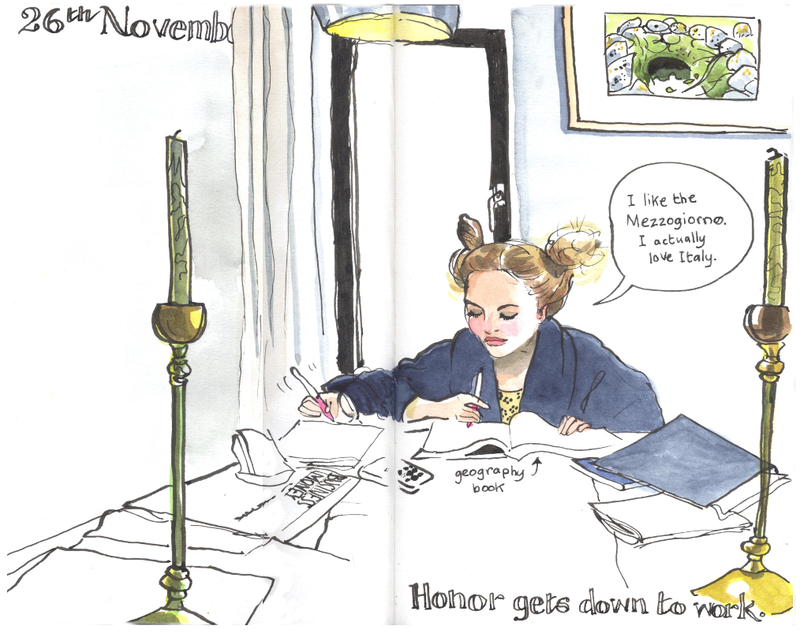 I have a nice little sketchbook on the go at the moment, a Fabriano Venezia. Weirdly, it's not watercolour paper but cartridge, and yet it responds really well to my desire for artistic expression. It's funny how the format of a sketchbook affects my inspiration. Maybe I like the portrait format because I draw a lot of...portraits. I love to draw people. I love to draw what they say to tell the viewer, or to remind me, of what exactly was going down when I was sketching them. Here's my dad Paddy a week or so ago. This sketch shows him just how is. He is nuts about music, albeit in a narrow range of genres. 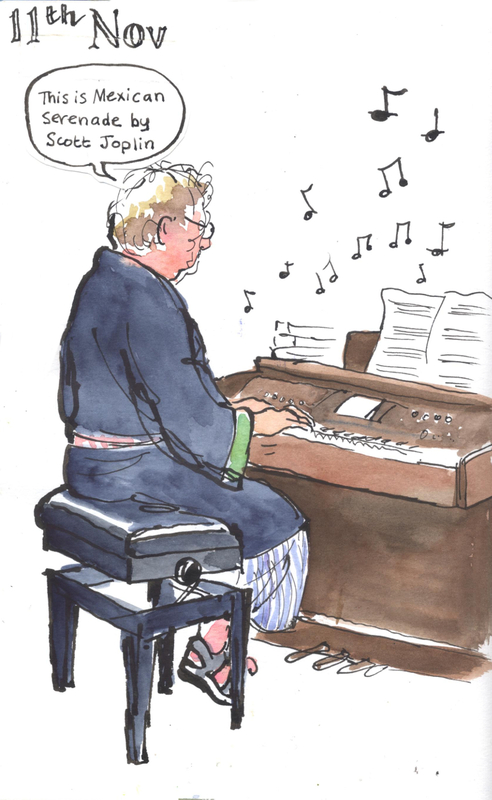 He loves classical music, musicals, showband, dixie...the night before I made this sketch we sat up and watched George Formby ("When I'm Cleaning Windows") doing his thing in black and white on Dad's laptop. I went to bed with the jolly sound of ukelele still jangling in my mind. Dad is never happier when listening to, or discussing, the music that he loves, but gets quite cross about music he sees as being lacking in melody (we disagree occasionally). Dad loves the electric piano the family got him for his 70th birthday, over ten years ago. He will sit for hours with headphones on, tinkling away at the keyboard. Dad is not particularly given to strong language - we were brought up to believe that swearing displays a lack of vocabulary, and I still don't say bad words in front of my parents - but he let slip a very soft Anglo-Saxon word just under his breath as I sketched him. Then, because my parents mightn't see the funny side, I thought I had better cover it up, should they be leafing through my sketchbook. I cut out a second speech bubble with a tab attached and stuck it on top of the first, date and all. A few days ago, I wanted to draw the boat we've just bought, but the sketch needed a person to add interest. 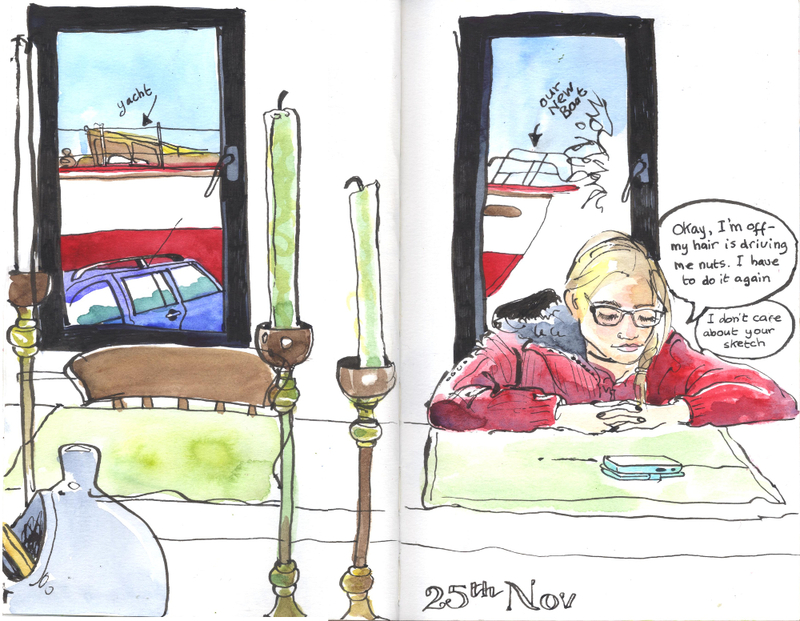 It was too cold to sit outside and make a proper sketch job of the boat, and a view of a bit of it through the window wasn't going to cut the mustard. My daughter Liv was available and didn't appear to be doing much. Since becoming a teenager, she has become tall, confident and...sassy. Where once she would have sat however I wanted her to sit, and for any amount of time, she is no longer as obliging. "Would you stop moving!" I said. She's an extreme fidgeter at the best of times, and today was worse than usual. The plait she'd put in was falling out a bit and she kept jumping up to re-plait it. She's still a great subject though, and I will continue to pester her to sit for me. She has cropped up frequently in my sketchbooks across the years, and it warms my heart to look at sketches of my youngest child. So yeah - we bought a boat! It is eighty years old and a piece of history, and my husband Marcel intends to restore it to its former glory. Every man who climbs the ladder to have a closer look comes down and says to me, sotto voce and with a serious expression, "He has his work cut out for him, you do realise that?" and "Does he know what he's taken on?" etc. etc. My favourite is one I hear a lot - "Don't you mind having a boat in your drive?" (Answer: yes, a lot, but I believe in giving one's spouse freedom to indulge in pet projects). I wanted to record it in a sketch in the days following its arrival, just to remember the sense of excitement and anticipation we feel right now...and, insurmountable task or not, it's a great way to give delivery guys directions. A day or two later my eldest, Honor, decided to do some study for Christmas exams which are coming up later this week. She has not had an easy journey through the teenage years, and I was very pleased to see the focus and determination she showed. I was also especially pleased that she took out the dreadlocks she had woven into her hair over the previous few weeks, of which I heartily disapprove. The dreadlocks gone, her hair had ended up in a great frizzy mass, so the only thing she could do was to put it into two buns. I was so happy to have a chance to sketch her, as she does not feature much in my sketchbooks, either because she hasn't been around, or because we haven't been in a good mood with each other. My daughter always looks impossibly glamorous, matted chunks of hair or not. We do not resemble one another physically at all: I have a pink complexion and pale red hair, but my young lady has inherited her half-Mauritian father's looks, with sloe eyes and olive skin courtesy of a Pondicherry beauty in the tropical family tree. 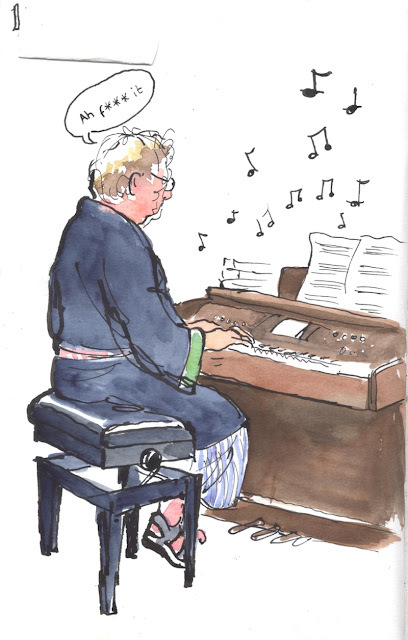 She is enveloped in a black velvet dressing gown in this sketch: this is her normal day-time wear, and fits the starlet look she channels with such ease. I am overjoyed to say that I suspect the drought of sketches of my eldest is over, and my beloved, almost-grown child will appear more often in my sketchbook. Meanwhile, I can feel some more speech bubbles coming on...thank heavens for urban sketching and the indulgence of telling a story.